Marlborough – Sports fans joined history buffs Jan. 30 at the Marlborough Senior Center to hear Bob Kane present highlights of the city&apos;s sports history. 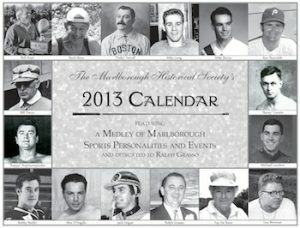 Many of those memories are detailed with photos in the 2013 Marlborough Historical Society&apos;s sports-themed calendar, dedicated to community leader Ralph Grasso. The January page profiles Richard Busa, who began running at age 53 and has raced over 70 marathons nationally. Now 83, he still resides in Marlborough, Kane noted. For February, the calendar includes Bobby Butler, who displayed potential locally before being signing with the National Hockey League&apos;s Ottawa Senators. He now plays for the New Jersey Devils. With a boxing theme for March, Kane spoke of an impressive fight for Alec D”Angelo in the 1930s at Marlborough&apos;s Lyonhurst Ballroom. “Alec fought three one-rounders and won every one of them by knockouts,” he said. April features baseball player Kenneth Reynolds, a MHS graduate. While in college, he was drafted by the Philadelphia Phillies, and later played with other major league teams. After coaching baseball at MHS for many years, Reynolds retired and still resides in Marlborough. May spotlights soccer player Mike Burns, who was named Massachusetts High School Player of the Year in 1987. He competed in the 1992 Olympic Games in Barcelona. “He was the captain of the U.S. Olympic hockey team, so that tells you he was well-liked and a leader,” Kane said. June pays tribute to the Marlborough Classic, the golf tournament founded in 1981 by Kane. Held at the Marlborough Country Club for three years, the tournament&apos;s winner in its second year was golf legend Arnold Palmer. Baseball is revisited in July with Duke Farrell, known as the “Duke of Marlborough.” Farrell Field at Sawin Street was named in his honor. “Duke Farrell was a major league catcher, and he played for 18 teams in his 18-year career,” Kane said. August covers harness racing, which gave Kane a chance to share stories of seeing his friend, Jack Hogan, racing harness horses at Foxboro Raceway. September hails the Shamrocks, the minor league football team owned from 1978 to 2007 by Bob Kays. The team won the National Championship six times. “The Shamrocks put Marlborough on the map!” Kane cheered. For October, the calendar returns to the Marlborough Country Club, where golfer Fay Deruvo won 28 championships. “When she was 78 years old, she shot her age,” Kane noted. November tackles football with two MHS Athletic Hall of Fame honorees. Mike Long, a 1956 graduate, made the roster of the first Boston Patriots team. Leo Brennan, a 1937 graduate, played guard for the Philadelphia Eagles. December features longtime Marlborough resident and professional wrestler Arthur “Kappy” Kapetanopoulos. Among his notable opponents was Killer Kowalski.